For a short stretch in the 1940s, Alan Ladd was Hollywood’s newest golden boy. Blessed with straw-blond hair and an amiable crinkle around the eyes, he was dashingly photogenic in spite of his short stature. He spent much of the ’30s as an unnamed extra, playing soldiers, sailors and the like. It wasn’t until 1942, when Ladd was 29, that he became a bonafide movie star. His breakout role would be film noir This Gun for Hire, propelling him and his sultry co-star Veronica Lake into huge success. A series of stylish detective films starring the pair followed. Ladd had redefined the hitman forever—rather than a clumsy goon, the archetype became an impassive, shadowy figure with a coldly handsome demeanor. (Alain Delon certainly owes this portion of his career to Ladd.) Ladd was never a romantic lead in the Tyrone Power mold, but he nonetheless became one of the most popular leading men of the decade. But the road to stardom was a rocky one for the star. By the time he had cultivated the smooth, laconic persona of “The Raven” in his noir roles, he had a reason to seem cynical. Ladd had been raised dirt-poor in Los Angeles by a booze-soaked single mother. After his father died suddenly, he and his mother were left destitute, and Ladd was forced to work at whatever odd jobs he could. From the age of eight, he picked fruit and sold snacks at concession stands. The underside of the glamorous city was familiar indeed to Ladd. The up-and-comer was working steadily as a grip and an extra at Warner Brothers by the late 1930s. But in 1937, tragedy struck. Ladd’s mother, after asking to borrow money from him, bought poison and drank it in the backseat of his car. She effectively committed suicide in front of her son, who became increasingly reliant on alcohol to cope with the trauma. Around the same time, the twenty-something had also married, divorced, and re-married, with several children to boot. He’d certainly experienced much of life before embracing the insular madness of fame. Perhaps this was why he was never able to fully commit himself to the luxurious lifestyle of the leading man. Ill-equipped for stardom, the actor was never convinced of his talent nor his attractiveness. Many a costar commented on his manifold insecurities. “I have the face of an aging choirboy and the build of an undernourished featherweight,” he once said. Self-conscious though he was, he worked across several genres before the ’40s came to a close. His All-American looks allowed him to easily fit into westerns, war films and heroic leads. In 1949, he took a shot at actorly seriousness when he played the ultimate WASP: Jay Gatsby. This version of The Great Gatsby was met with mixed-to-negative reviews and a lukewarm box office, which did nothing to quell Ladd’s increasing emotional problems. Shane, though now far and away Ladd’s most notable claim to fame, was actually filmed around this period, and shelved by Paramount for several years. Hard as it is to imagine now, the star’s career waned slightly in the early ’50s, only to be catapulted back to the top with the 1953 release of the beloved Western. It was an enormous hit, and remains one of the greatest and most romanticized creations of Hollywood’s Golden Age. The title character’s calm, graceful heroism has a degree of self-effacement that seems very characteristic of the actor inhabiting him. In many ways, this was Ladd’s finest moment—one which, to paraphrase from Woodrow Wilson, wrote history in lightning. 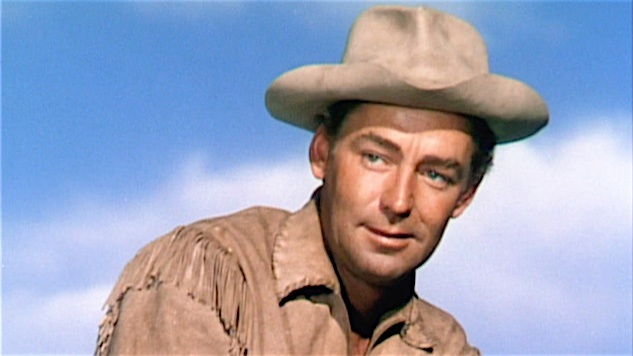 The ’60s proved to be the closing chapter of Alan Ladd’s life. His career hit the skids after he left Paramount Studios, and he struggled to gain the popular recognition he had only a few years before. Whether it was poor decision-making or changing audience taste is hard to say, but Ladd was deeply unhappy. After a life of ferment and chaos, the career inactivity seemed to tease out all of the star’s demons. His eventual diminishment into “has-been” territory seemed like a blow that his fragile ego simply couldn’t take. The magnitude of the actor’s alcoholism reached a new and frightening level, and as the once-athletic man grew bloated and haggard, roles only became scarcer. In 1962, a peculiar “accident” saw Ladd shoot himself through the chest with a handgun. He claimed to have tripped over something, but many suspected that it was a suicide attempt. Two years later, in 1964, a combination of booze, barbiturates and sleeping pills killed Ladd. He was only 50 years old. Arguments continue to this day as to whether Ladd died by accident or by suicide. Official autopsy reports ruled out the latter, but it’s perfectly possible that those reports were gussied up to avoid controversy. Ladd’s final film, The Carpetbaggers, was released later that year. After he suffered through a litany of flops, Alan Ladd’s last screen appearance was among the highest-grossing pictures of 1964. Among those who remember him, Ladd is still appreciated for his unique star presence. He was a taciturn, pint-sized hero, with a reserved charm at odds with his bright, blonde looks. It was this romantically moody image that Shane forever committed to the screen—thus immortalizing Alan Ladd forever.